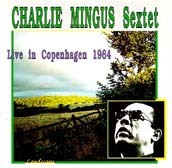 In April 1964, after performing in Amsterdam (the 10th), Oslo (the 12th) and Stockholm (the 13th), the Charlie Mingus Sextet arrived in Copenhagen to play in front of an audience impatient to see these musicians, preceded by a solid reputation; the bass-player himself of course, but also Dolphy, who had lived in the Danish capital and in Sweden in 1961, recording several albums; in	addition, his record "Out to Lunch" (recorded on 24th February 1964) was already very successful. The musicians were in terrific shape, the tour had just begun, Dolphy was pleased to be back with his friends, Mingus had just got over the disappointment of the announcement of Eric's	departure. The concert matched all the expectations which it had aroused and the enthusiastic audience appreciated the sextet which was at the height of its creative force, driven by an obviously happy Mingus and backed up by Dannie Richmond, both pertinent and absolutely unbridled. All the playing seemed to be infected by a sort of collective madness, sarcastic humour and pure beauty too : Johnny Coles' solos, with a sound evoking Miles Davis, the vehement lyricism of Clifford Jordan, the repeated boldness of Eric	Dolphy, the solo feature by Jaki Byard (a tribute to Art Tatum and Fats Waller), a temperamental and fantastic pianist, a player of synthesis, references and rereadings. The cohesion of the many lines and numerous tendencies, varying immensely in places, demonstrated by this almost legendary band, is assured with a master's hand by Mingus, the leader of men, of musicians playing the "black man's classical music", of which this concert is further and incontrovertible proof.